Enjoy an Aran Islands Ferry Trip! An Aran Islands ferry will take you to any of the three Aran Islands off the west coast of Ireland. The islands are Inishmore (Inis Mor in Gaelic), Inisheer (Inis Oirr in Gaelic), and Inishmaan (Inish Meain in Gaelic). Inishmore is the largest and most visited of the Aran Islands. Inisheer and Inishmaan are less developed and less visited, but are also worth the trip! 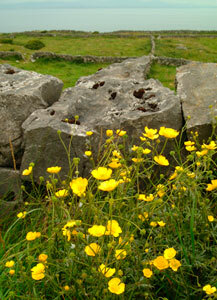 You will enjoy a step back in time when you visit the beautiful, rugged islands. You will see cottages with thatched roofs, fields divided by stone fences, and wildflowers as you stroll along the quiet lanes. You can walk, rent a bike, or hire a horse-drawn buggy to get around while you are on the Aran Islands. The islands have ancient forts, church ruins, and other historic and scenic sites of interest. You will find traditional music and food in the restaurants and pubs. Most of the residents speak Gaelic, but visit with tourists in English. An Aran Islands ferry can take you to any of the islands from the pier in Rossaveal, which is 23 miles (37 km) west of Galway just off of the R336. There are buses from Galway to the pier in Rossaveal if you need a ride to the ferry. Some of the companies have added ferry service direct from Galway to the islands. An Aran Islands ferry is also available from the pier in Doolin to Inisheer, Inishmore, and, as arranged, to Inishmaan. You can even get to the islands by airplane from Connemara Airport in Inverin, 19 miles west of Galway on the R336. See the Aer Arann website for flight details. Check the ferry details at the Aran Island Ferries website, the Aran Direct website, the Doolin Ferry website, and the Aran Island Ferry website. It is best to plan ahead with reservations if you know your itinerary. Remember, though, that ferry and airplane travel is always subject to the weather. 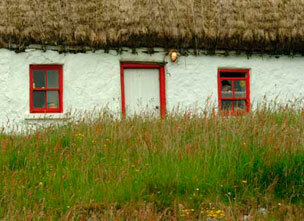 Take time to visit the Aran Islands on your next trip to Ireland; you'll want to stay!